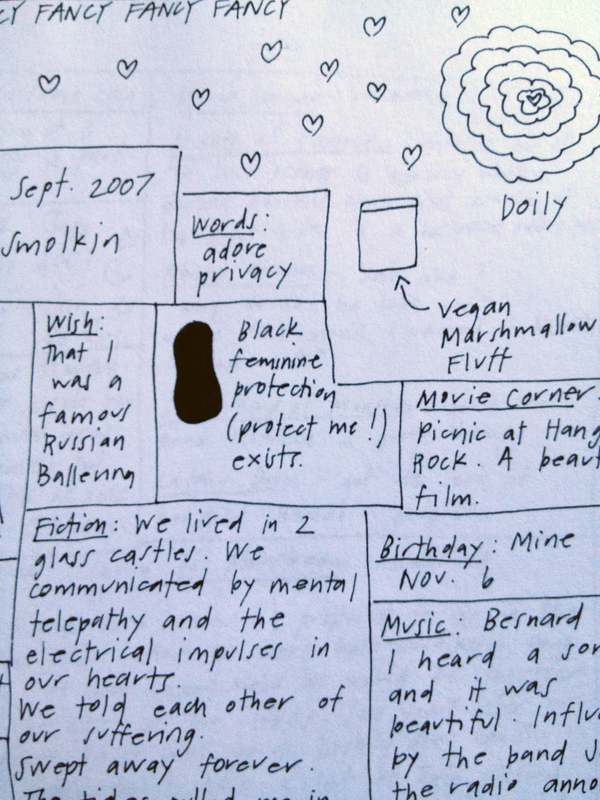 Newsletter Compendium 2007–2015 by Lisa Smolkin, a Toronto-based artist, is a collection of 19 handwritten, personal newsletters. 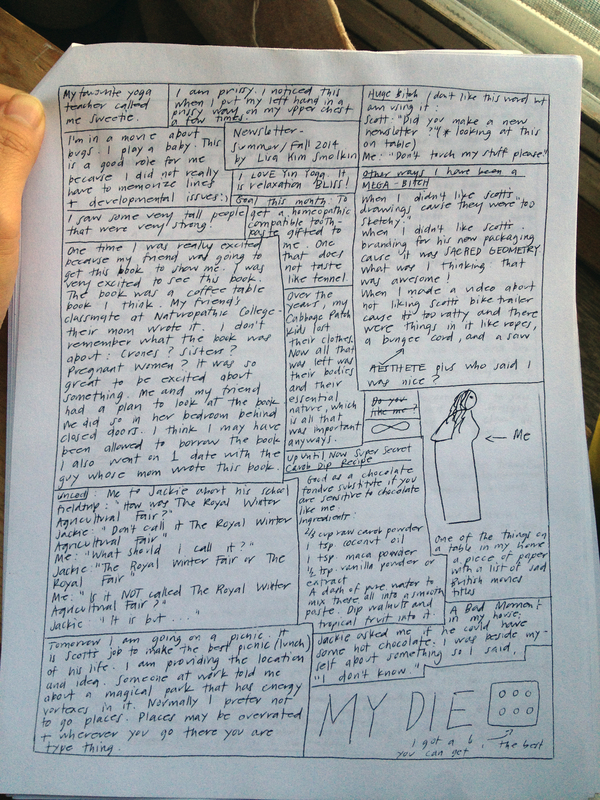 The one-page newsletters include recipes, poems, pregnancy-prevention/fertility-control tips, snippets of conversations between Lisa and her son Jackie, recommendations for movies, short stories, dreams, etc. They were originally mailed to people on an irregular basis (there are no newsletters between 2011 and 2013). 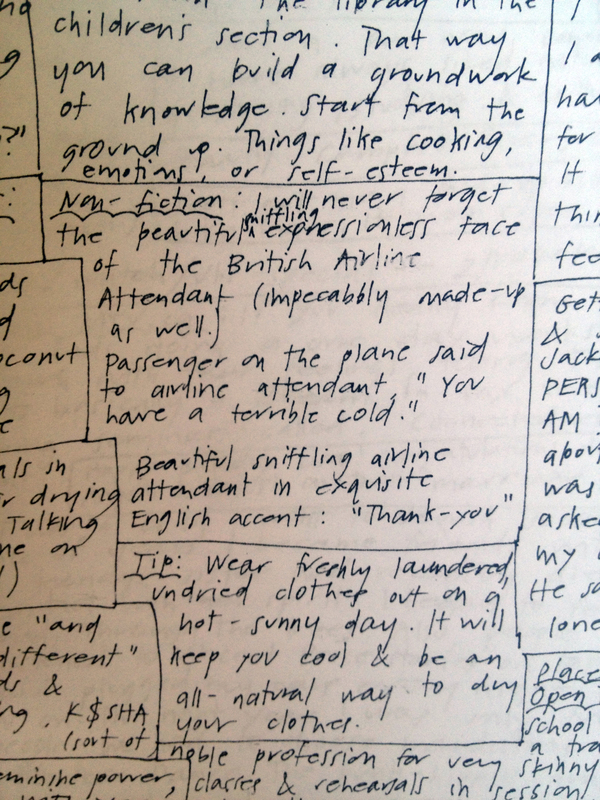 There’s lots of memorable one-liners—“Alienation corner: I dressed up like a flapper for Halloween :(”—mixed in with information that is more mysterious—“A 3-step process for making magical rags.” (“What you do with your magical rags is up to you. I chose to stack mine.”) The newsletters are mostly concerned with the “feminine”—the domestic, the pretty, the sensitive, the prissy—they love it and they laugh in its face. One of my favorite sections is from the Oct./Nov. 2008 newsletter, a letter written by Lisa to the premium health-food company Erewhon, prefaced with the intro: “A letter I wrote and sent almost 8 years ago to an oatmeal manufacturer.” In it, she thanks the oatmeal manufacturer for producing an “uncompromised,” 100% certified organic instant-oatmeal product. She writes: “In the shadow of my impending break-up with **** and the 6 wk. old ‘barely-human’ foetus I am carrying your quality cereal is sustaining me through to a better day… Although my inability to accept the reality of painful, horrifying, and very sad situations has not been touched by your cereal or the eating thereof….” The letter continues and is then signed, “Sincerely yours, a satisfied customer, Lisa K Smolkin.” As someone with low blood sugar who spends way too much money in health-food stores, I totally understand the abject impulse to express a sense of connection to a premium product. A letter with too much personal information, sent to an anonymous corporate mailbox: it seems like the only appropriate response to marketing. In another newsletter, Lisa writes about Doreen Virtue, a new-age celebrity who runs angeltherapy.com and has a popular YouTube channel, describing, in deadpan/all seriousness, her numerous abilities, strengths, and how she only meets the right people “for HER.” Lisa then goes on to write about herself, “I would probably be happier if I could find the magic in everyone and everything. Like today, to a workshop I came prepared with paper, pens, a drink, food, shoes for a party tonight… but now that I am here, there is already drinks, food, paper, pens and someone liked my regular day shoes. Doreen Virtue is an empath and clairsentient. That means she can feel what others are feeling, even when the others don’t always know what they are feeling. When I see someone trip, I gasp like I am tripping.” In capitalist culture, women are expected to manage their emotions while tending to the emotional needs of others; Lisa illustrates the impossibility of being prepared for that even while being totally sensitive to it. I believe in magic to the extent that I think that thoughts and words have power, but I don’t think happiness is any one individual’s responsibility. 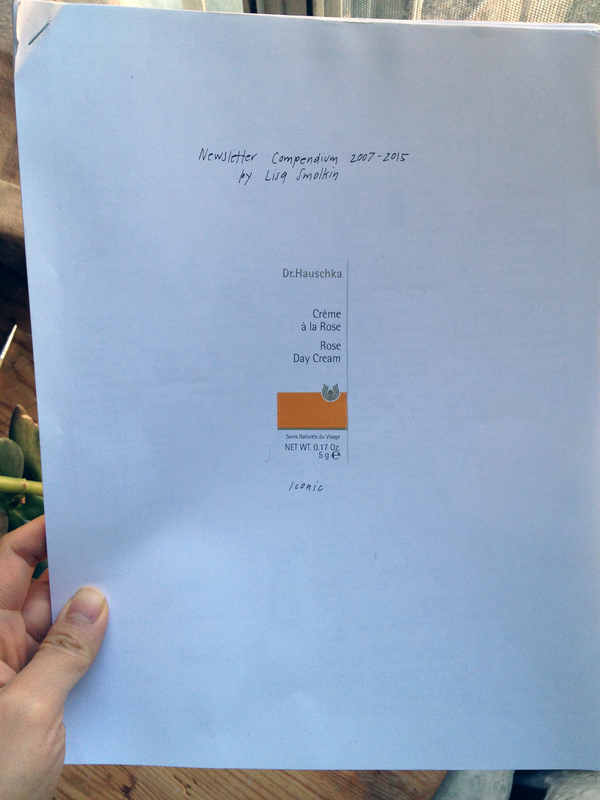 Lisa Smolkin, Newsletter Compendium 2007–2015, Self-published, 2015.